Influencer marketing is a valuable channel, when using credible influencers. Here are 6 of the most credible influencers including Kristen Bell, Nikkietutorials, Father of Daughter, Krissy Cela and more. We’ve spent the last 4 years working with influencers (over 75,000), and you’d be shocked at the types of people that have managed to call themselves “influencers.” But as a marketer looking to find the right influencers for your brand - sure, there are quantitative things you should be looking at, but you need to be digging deeper than that. Relatability, realness, engagement rate, and credibility matter, and they’re growing in value - both to businesses, and to customers. They’re not things that you’ll find by analyzing data, you need to go looking for them. What sorts of comments does this influencer receive, what their captions are like, what images are they posting, how are their images styled - are they real, are they Photoshopped? All these questions matter, and they’re what sets influencers apart. Instead of seeing a post and thinking “Wow, I wonder how much that person got paid,” people should be thinking, “If this person is using that product, I really need to try that product.” People will only say that if they’re invested in the influencer. And it takes a lot of time, energy and loyalty to build up an invested follower base as an influencer. But people have done it. And this is why real, reliable and credible celebrities and influencers are so valuable. And they can still make massive impacts for businesses. What are these influencers doing that makes them so good?! Well, we’re about to tell you. From characteristics, tactics, and everything in between, we’re going to uncover the most authentic influencers in the industry, and why they’re so good for ecommerce businesses. 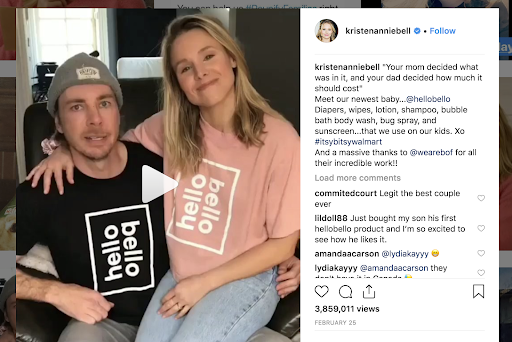 Hailed America’s “Mom & Dad,” Kristen Bell and Dax Shepard are part celebrity, part influencers, part business owners and part real people. They recently launched their new “baby,” Hello Bello. And yes, it rocked the baby industry in a big way. Hello Bello is a premium line of baby products, sold for non-premium prices. Their tag line “for kids who sh*t their pants,” might not appeal to every single parent, but it sure does appeal to a large majority. Within days, Hello Bello already sold out of most of the products on their website - just from a few Instagram videos and a handful of Instagram posts. Kristen and Dax might be celebrities, but at the heart of it, they’re also just trying to keep it together like a lot of other people. A brand such as this made sense to be paired with them, and also appealed to a large proportion of their followers. So the brand / influencer fit is highly evident which adds a layer of trust and credibility to the promotion. Their style is simple, nothing is over done or over curated. For example, their Hello Bello launch video was simply Kristen sitting on Dax’s lap explaining the premise of the brand and telling people how excited they are. This “no fuss” straightforward messaging is what makes them so relatable, and likable. It’s what makes them one of the most real influencers / celebrities / people out there. She is a teacher and a reviewer, and people look to her for advice. Rather than telling people every single foundation is her favorite type of foundation, she uses her platform to try and test various products that are going to help her get the type of look she wants. Viewers go searching on her page for the looks they want to achieve, watch the tutorials that give them that look, and then go searching in the product descriptions for the products she’s used. This business model is interesting because companies simply want their products featured in her video for the pure mass exposure they receive. On top of all of that, she’s not afraid to show her followers every side of her. She embraces “the glow up” and always refers back to images of herself with no makeup on, highlighting to her audience that she doesn’t just wake up looking like this. She truly believes in the power of makeup and what it can do for people and their confidence. She connects with her followers, constantly motivates them, and pushes them to be comfortable in their own skin. It doesn’t get more real than Celeste Barber. Celeste spends most of time time making spoofs of celebrity images and videos that have recently rocked the internet. But how does making fun of celebrities turn you into a good influencer? The answer lies within the power of building a loyal and real audience base. She is unapologetic, completely carefree and doesn’t care what you have to say about her. It’s these sorts of characteristics which make her so loved by her followers. 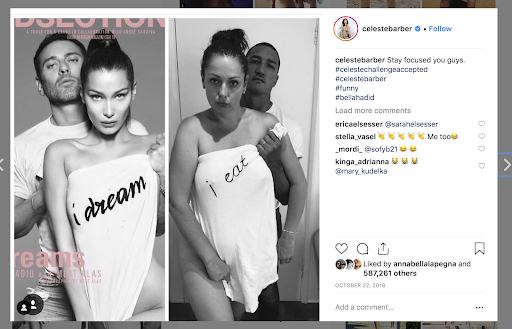 With 5.5 million Followers on Instagram and 1.3 million followers on Facebook, she has barely done any collaborations with any company - until now. Hello Fresh snapped up the influencer for a new campaign called “Skewered” which sees Celeste hosting her own cooking show, make fun of herself, and showcasing how average she is at cooking. A brand whose core business strategy revolves around people that don’t have time to prepare an extravagant meal and have a million things on the go is the perfect fit for someone who’s idolized for their real and raw representation on the reality of life. The campaign has already been viewed over 1.1 million times. The fitness influencer trend is HOT right now. With the rapid rise of athletic wear companies, and their intense ambassador programs, some influencers have managed to set themselves apart from the rest and really establish their own path. Krissy Cela is one of the ex-Gymshark ambassadors that recently started up her own workout clothing line. But there are reasons why she is such a strong influencer that brands desperately want to work with. Firstly, she’s incredibly brand loyal and honest. You’ll never see Krissy posting with multiple different supplement companies for example. She’s been a Women’s Best ambassador since the beginning of time, and while despite receiving offers from other companies, she’s not one to switch out a collaboration for more money. Similarly, when she was at Gymshark, she built her trust with her followers by showcasing the faults and flaws of the designs. She is very committed to her followers, and always responds to comments, despite receiving thousands, and she does her best to talk directly to her customers on a regular basis. She’s also incredibly consistent. If you’re a follower of Krissy, there’s not a time when you check your feed where her content isn't there. As a brand using an influencer like this, that’s incredibly important as you’re always following their journey and you can’t help but not see the products she’s using and what she’s doing. 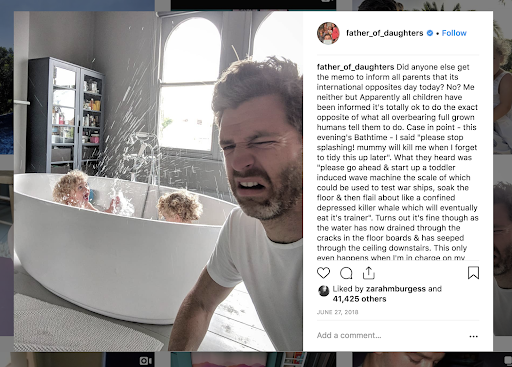 Arguably the real OG of Instagram Dads, Simon aka “Father of Daughters” runs the comedic parenting page we can’t help but fall in love with and we can’t look away from. Married to Clemmie (aka Mother of Daughters), Simon is a father of 4 daughters. While he gained a lot of traction in the earlier days for mostly making fun of himself and the silly things his children would do to themselves, or him, there are other factors that make him a powerful influencer today. A large one being the depth of insight he adds in to every single one of these posts. For example, there’s not one caption on his entire page that’s less than a full paragraph in length. It’s really like reading a novel into his life. His captions are usually full of descriptive detail, humor and advice that are both designed to amuse his followers, but also provide them with valuable insights. Some might argue it’s information overload, or too much to share, but there’s a reason he has so many followers and generates insane engagement rates on his posts. He rarely does sponsored posts, but when he does, there’s so much information and detail that you almost forget that you even read #ad before the caption even started. It’s that sort of commitment to filling in his followers that makes him believe trustworthy and relatable. When an individual rises to almost sudden fame after leading a normal life just like the rest of us months before - it’s pretty cool. What’s even cooler? People that don’t forget that and take fame and attention in stride. 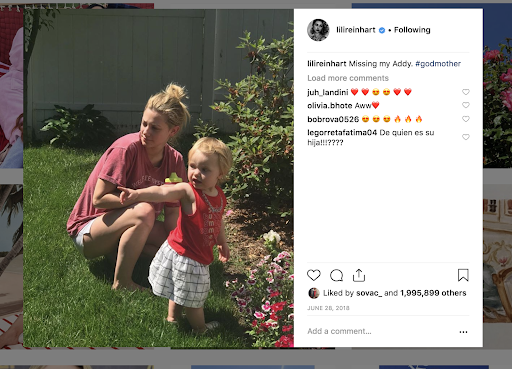 Lilli Reinhart is that person. Lili, and to be fair, most of the Riverdale cast, weren’t already trending stars when they landed their roles on the hit show Riverdale. Since the show aired, they’ve become our favorite social media trolls, and also some of the most influential celebrities. Lilli is the dream brand ambassador for many businesses. She’s passionate, she’s smart, she’s an idol to a younger generation, she’s brutally honest and stands up for what she believes in. If someone calls her out or she seems something in the media that she’s not a fan of, she’s going to tell you about it - even if you don’t care. Her and her cast mates also love making fun of each other and regularly make light of the superficial world in which they’re now a part of. It’s these sorts of personality traits that have led to her developing a crazy loyal fan base, and as such, they’re what makes her such a powerful influencer. Lili barely does any social media sponsored posts and they’re scattered sparingly around her social media. But when they’re there, they’re strong, and relatable. She doesn’t usually just collaborate with brands, she partners with brands. Take her collaboration with Dermalogica. Lilli has always been very open about her battles with skin issues. From posting about them in her stories, to posting pictures with no makeup on and pimple cream on her face, she’s very open to her followers so she showcases that what they see on TV isn't’ the real her. But rather than just doing a random sponsored post for the company, she decided to actually partner with them to help launch their new line of products that were specifically catered to help deal with issues like the ones that she was facing. She sticks to a handful of brands, a handful of products, and really brings home the messaging so that the brand message and it’s benefits are clearly seen and heard. To sum it up, there are a lot of factors that contribute to making an influencer “real” and believable. But what it really comes down to is how well that influencer fits that product, and how organic it seems. Every brand is going to have a different set of objectives when it comes to influencer marketing, but for something to really convert, it has to seem legit. This article showcases the diversity of tactics that are being used by influencers, and how powerful each of them are in their own right. Blackotter is a business accelerator agency that grows disrupting brands. We specialise in consumer brands and offer innovative omni-channel marketing solutions that help brands grow and scale profitably. Our services are diverse and include; digital marketing, influencer marketing, social media marketing and website design & development. Don’t think of us like an agency. Think of us as an extension of your own team. One that’s dedicated and determined to help you reach your ultimate goals.